Milling is an operation on metal, plastic or wood, in which the material is removed using a rotating cutting tool, the cutter. Milling is done on a milling machine, which is often computer-controlled nowadays, which is called a CNC milling machine. The workpiece is clamped in the machine on a table. This table can be moved in various directions, while the revolving cutter cuts the material away. The cutters are available in various embodiments. There are end mills, key way cutters, round end mills, saw mills etc. The cutters are often made of high speed steel (HSS) or hard metal, often carbide inserts are placed in a tool holder. During milling, especially in metal cutting, cooling fluid is often used to limit heat damage to workpiece and tools. This is CNC Milling Process. Milling machines come in many shapes and sizes. Characteristic of this is in how many directions (axes) the machine can work the workpiece. Often the tool is on a vertically moving Z-axis, and the workpiece is on a 2-way movable table (X-axis and Y-axis). This is then a vertically operating 3-axle. If the table itself can also run on the X-axis, then it is a 4-axle. When the table also revolves around the Y-axis, we are dealing with 5-axis milling. however, other conceivable principles according to which a milling machine can be built. For example, there are also horizontal milling machines and portal milling machines. Instead of stopping the axes in the table, you can also pick up the shafts in the milling head. The workpiece can then stand still and the milling head moves. This is especially interesting for very heavy workpieces. Do you want to outsource CNC Milling Projects and do you have technical drawings (PDF, STEP) available, or just a general sketch of what you are looking for? We are able to be serving with the CNC milling of almost all metals and plastics. We are happy to tell you more about our possibilities in CNC milling, so that you can get a good idea of how our services can take you to a higher level. In addition to CNC milling, we are also specialized in CNC turning and long turning. Do you want your products to be CNC milled in series and delivered on demand? We can work on the basis of framework contracts, forecast planning and just-in-time deliveries. You can never stagnate with you. For serial production in the field of CNC milling, you have come to the right place at UYEE. We have extensive knowledge and experience, and work with professional machines, if necessary with robot loading. If desired, the quality can also be substantiated with measurement reports from a 3D-CNC measuring machine. If you do not have technical drawings yet, we can also facilitate this. No matter how far you are in your design phase, we are happy to be of service to you with our knowledge and experience, to finally arrive at easily feasible parts in our CNC Machine Shop, and to provide you with the perfect and adequate parts just-in-time. CNC milling is an operation in which material is removed. Where milling normally was done manually first, we now use a CNC controlled machine computer system. Especially for our CNC machines computer system we have a specific software for programming our machines offline. 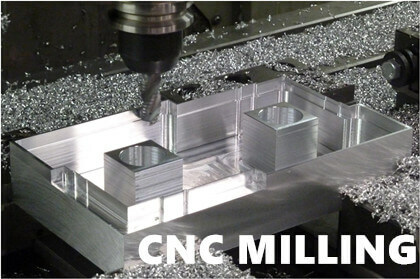 When CNC milling we distinguish between co-milling and reverse milling. In the case of trailing milling, the rotation of the tool as the feed is kept in the same direction. In the case of reverse milling, the rotation and the feed are used in the opposite direction. CNC milling can be applied to different materials. This can be done on all metals but also on most plastics such as nylon and POM. The advantage of CNC milling compared to conventional milling is that CNC milling is generally more accurate. CNC Milling Services is also more suitable for serial work and more complex products. Conventional milling is mainly used for one or more pieces and where the products are simpler. UYEE has an extensive machine park with the most modern CNC machines with which customer-specific parts are made. The materials that are processed are very diverse from ferrous and non-ferrous metals to technical plastics. The products that Van Gestel produces fine metal vary from large to small and from fairly simple to very complex. One of our strengths is the production flexibility. On the one hand, this is due to the broadly trained and skilled personnel. On the other hand, there is a large choice of machines for turning, milling, or combined work. Through years of experience, our specialists are able to facilitate standard and customized solutions. Do you have a complex issue or a complex application? Our engineers like to think along about the manufacturability, choice of materials, etc. Even for simple products, both single and serial work, the specialists are at your service. We have 3 different machines for CNC milling. Each machine specializes in a particular process of milling. For example, we have a Unisign Univers 4 that is used to process long products. We also have two different Feeler machines. These machines are equipped with a tool change system for 20 tools and have an automatic chip discharge. Serial or single pieces? We will then cut your material on a computer-controlled basis. When CNC turning and milling, the end products are manufactured with the utmost accuracy too, we constantly realize which requirements are set for the Prototype Machining Services and the finished product. Due to the large diversity of our machinery, we can quickly switch within the production process. You can contact us for almost all types of materials (plastic, aluminum, steel, stainless steel, bronze, brass, etc.) in both 2D and 3D. For the control of the CNC machines we use a CAD-CAM program to limit downtime of the machines as much as possible. The unique combination of efficient machine use, work layout and the large amount of materials that we always have in stock ensures that you benefit from absolute top quality and unprecedented fast delivery. Because of our knowledge and experience we can mill very complex issues, but smaller projects are also welcome.